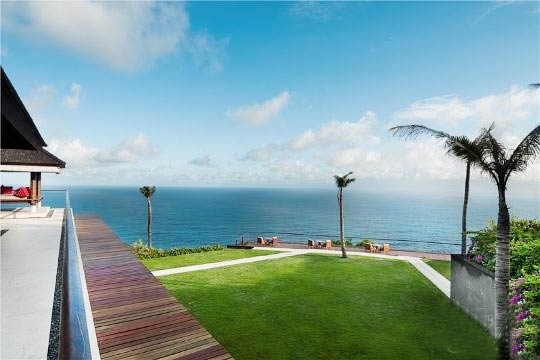 Practically owning the views over the Indian Ocean from its cliff-top vantage point, The View is the 5-bedroomed signature dwelling at the stunning villa complex known as The edge. 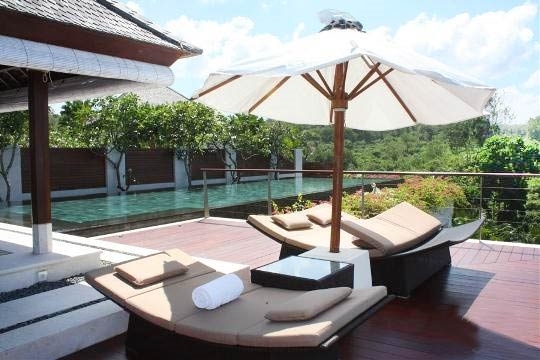 Fully staffed and designed to go beyond the extra mile, this is a villa for those who have reached the very top. 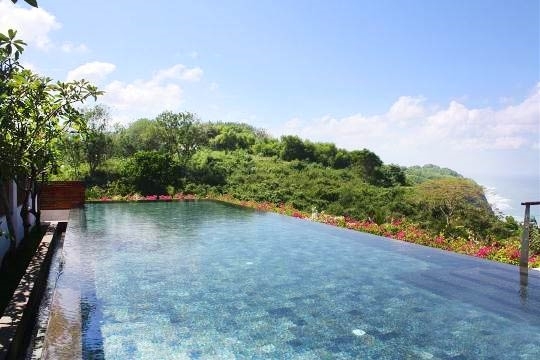 The View is the pièce de résistance of The edge estate, a cluster of three villas on the southern cliffs of Bali’s Bukit Peninsula with one of the most extraordinary views, levels of service (and tariffs) on the island. A masterly master, this is a five-bedroom residence with an opulence befitting life’s true achievers, their friends and their families – particularly families, since guests have the lion’s share of the estate’s facilities. 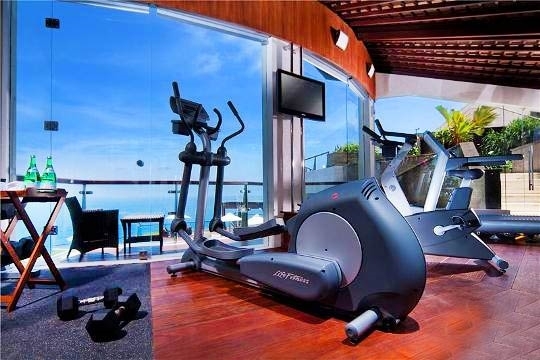 Although all guests at The edge can use the spa, the fitness centre, communal pool and restaurant, it is The View that has the most bedrooms (all with ocean views of varying degrees) the wine cellar and cigar room, the playroom, the home theatre, the formal dining area, and the two private pools – including a shallow one for kids. 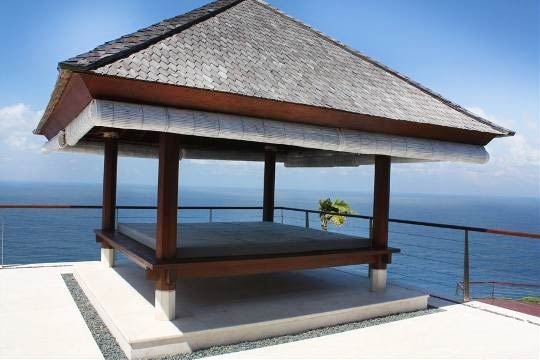 And there’s no shortage of places to get horizontal: the main living room has excellent long sofas facing the sea, and the pool terrace has a large balé bengong relaxation pavilion as well as double sun loungers – again blessed with those knee-buckling views. Downstairs is a second large living room leading out onto a grassy lawn, and a special leather-chaired, air-conditioned, ‘boys club’ smoking room replete with top-of-the-range Cuban cigars, wines, Scotch and brandy. Mums and dads won’t be able to drag the kids away from the brightly coloured and designed playroom. Two game systems, an indoor playground, bunk beds for an afternoon nap and loads of toys and activities are sure to keep them busy. 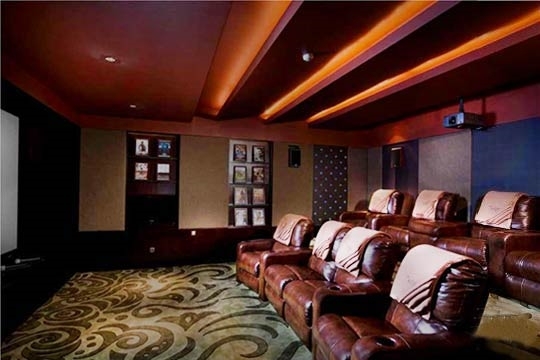 Then there’s the cinema room, which is the sort of indulgence you’d imagine Spielberg having at his own guesthouse. 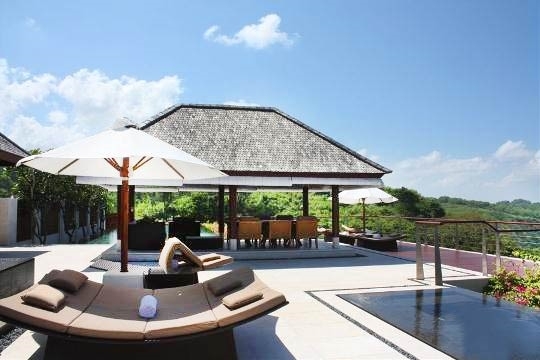 Like the other two villas at The edge (three-bedroomed The Cliff and two-bedroomed The Mood), The View is fully staffed by highly trained professionals, including a five-star chef and personal butlers who are nothing if not discreet. Even guests who are used to having their own staff at home will be noticeably impressed. 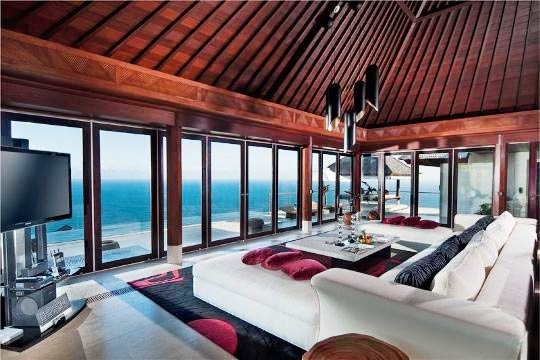 It’s not the cheapest villa on the island, but for those to whom money means little, there will be no complaints. 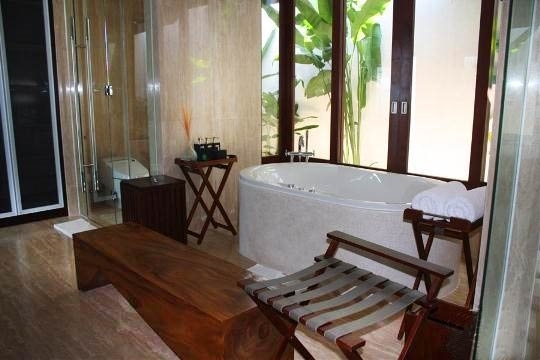 Oh, how we loved this villa! There is something magical about lying on a sun lounger, on a cliff so high above the pounding waves that oxygen might become necessary, with a cold drink in your hand, a liberal coating of sunscreen on your skin and, best of all, nothing whatsoever on your agenda. This is the kind of view that inspires much of the world’s most beautiful poetry: so mesmerising that magazines may well remain unread. 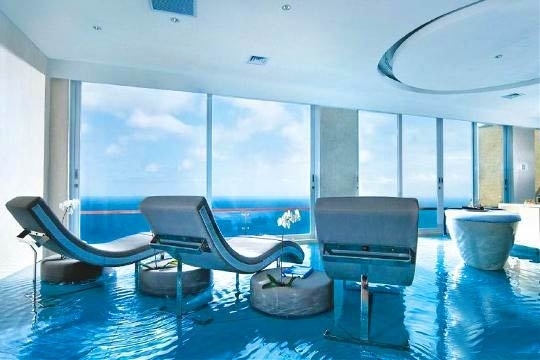 When you do come down to earth, take the time to have a spa treatment in the jaw-dropping facility – the floor is covered in three inches of water and the treatment beds seem to float between the sea and the sky behind the billowing white curtains that surround it. The service was impeccable and the food amazing, just what you might expect from highly trained professionals. Our Magnum-trained butlers were quick to spot an empty glass and could always sense a hungry tummy. Breakfasting on the shady terrace was a wonderful way to start the day: inspiring us to take on all the great things we’ve always wanted to do. Rather a shame, perhaps, that in the end we opted just to lie on the sun loungers gaze at the ocean and work on the suntan. 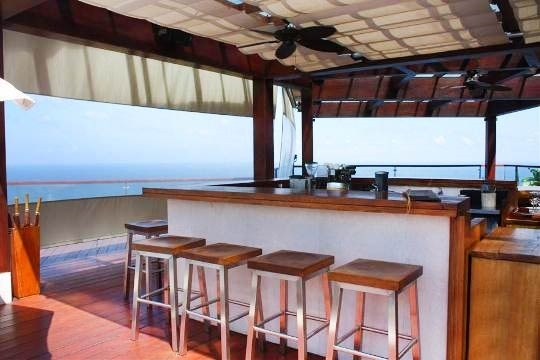 The views and the abject luxury rate pretty highly by international standards. There is nothing here that you could possibly want for and nothing is too much trouble. The home cinema is exceptional, as is the spa! In the dry season when the winds get up it can be a bit breezy on the terrace but when the sun is shining and the weather is hot that can be a blessing. We really wanted to open up the villa to let the sea breeze come in and take over but the staff warned us to keep them shut because of the kleptomaniac monkeys that live in the neighbourhood. Nevertheless, the monkeys are highly entertaining to watch. A lily pond and carved stone frieze greet guests at the grand entrance to The View before they step into an open-plan marble hallway. At the top of the six steps is the grand living and dining room with a table for 14 and a deeply cushioned plush sofa for ten facing the pool deck and the dramatic ocean view. 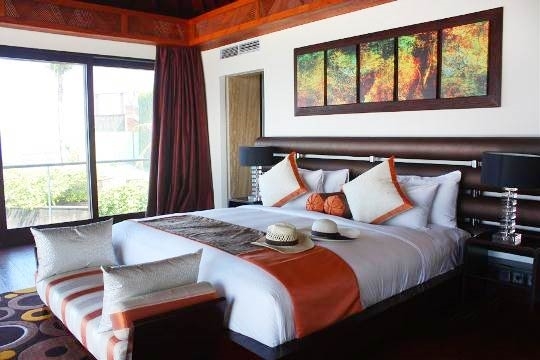 The room is lit by lanterns that hang from the high vaulted timber-lined ceiling, while more funky lamps and artefacts, plus a 52-inch TV fill the spaces. Two master suites lead off from the living room, and have glass doors opening onto the pool deck. 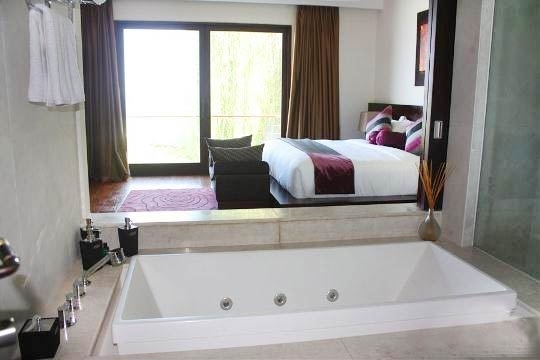 The bedrooms both have awesome sea views, king-size beds, individual colour themes, and elegant ensuite marble bathrooms with indoor and outdoor showers and jacuzzi tubs. A third ensuite bedroom is located to the rear of the living room and has a king-size bed with a west facing aspect and sea views. 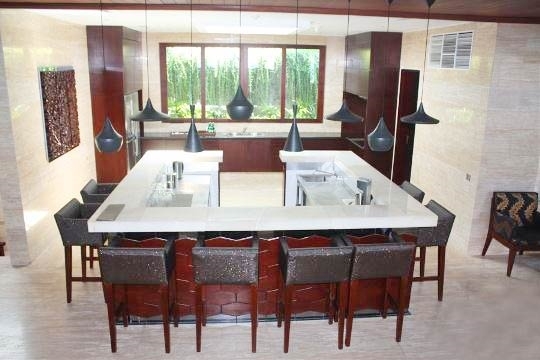 To the back of the living room is a feature kitchen with a huge wrap-around marble bar that comes alive at night with hidden lighting. Fronted by eight high stools, this a great spot for both cocktails and breakfast. A staff kitchen is adjacent. From the kitchen a grand staircase descends to the lower level where, alongside bedrooms four and five (identically designed, king-bedded and both opening out to a lawn), is the playroom, a wine cellar, home cinema and second living room, which leads out to the wedding lawn – all of these rooms are state-of-the art. 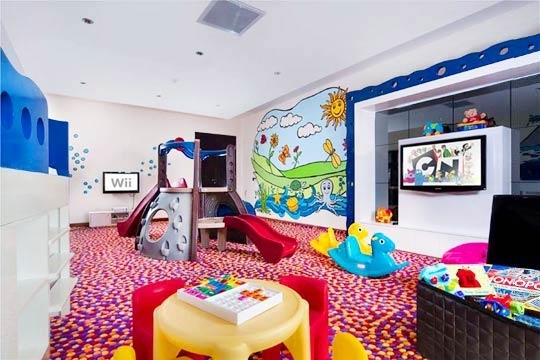 The playroom is filled with toys, activities and colourful wall murals, a PlayStation AND Wii, and a TV each to play them on, plus an elevated bunk bed and a plastic slide. The soundproofed cinema room opposite is built for professional enjoyment with leather lay-z-boy chairs, a 5 x 3m projector screen, and a karaoke machine. 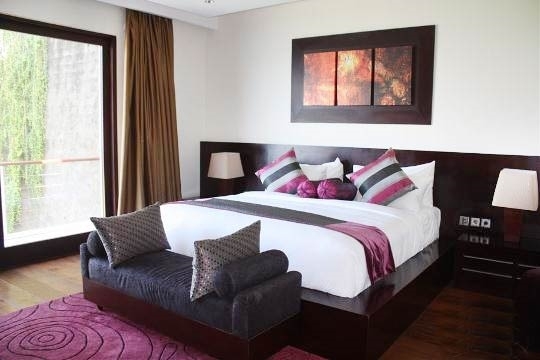 Guests at The View also have full use of the estate's communal facilities, which include a fully equipped gym, a spa, and a cliff-top restaurant and bar, all situated at the front of the property around the communal pool. A connecting door links The edge to its three-bedroomed neighbour, The Cliff. 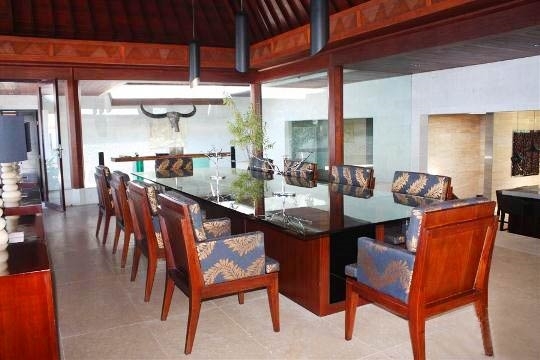 5 bedroom villa located in The Bukit, Bali. Ideal for Beach in ten, Bring the relatives, Kid friendly, Gastronomic delights, Going for golf, Fair share for groups, The great outdoors, Spa sensation, Sensible for seniors, Room with a view, Perfect for weddings.